About 100 million years ago, a tiny beetle flew into a coniferous tree and became engulfed in its resin. Though the tree fell to ruin in a time long forgotten, a drop of its resin fossilized into amber—with the beetle fully encased—and then survived the relentless ravages of time, resulting in one of the most spectacularly preserved ancient beetle specimens yet described. First discovered in Myanmar, the rare fossil is now in the hands of international experts who are thrilled that it has managed to remain so exquisitely intact after almost a million centuries of existence. "For a beetle taxonomist and for the entomological community as a whole, this is an exciting discovery," said Michael Caterino, the director of the Clemson University Arthropod Collection. "This is an extraordinary 99 million-year-old fossil in Burmese amber. We can see all the details of the external sculpturing of the wing covers and the head. We can see the mouth parts, which enable us to predict that this was a predator much like it's modern relatives. And it has a lot of tantalizing characteristics that we hypothesized early members of this family had. But we no longer have to guess. Now we can confirm." The ancient insect is a member of a family of beetles called Histeridae, which still thrive today with more than 4,000 species. The specimen is only about two millimeters long, which is about the width of the tip of a new crayon. "Insects are such a vast group that most people who work on them tend to specialize in very small subsets," said Caterino, who is Morse Chair of Arthropod Biodiversity at Clemson. "So even within beetles, I specialize on this one family: Histeridae. Mostly I study living members, doing fieldwork throughout North and South America in pursuit of new species. But I also try to put together evolutionary trees and see how they have evolved over time. That's why the discovery of this fossil was so exciting to me. It provides tangible evidence to back up some previous inferences, but it also reveals some surprises." To ensure that it remains undamaged, the beetle fossil is now housed in Stuttgart State Museum of Natural History in Germany. Caterino has not seen the fossil in person, but his museum partners have provided him with high-resolution images that have enabled him to intensively study of the insect's visible features. 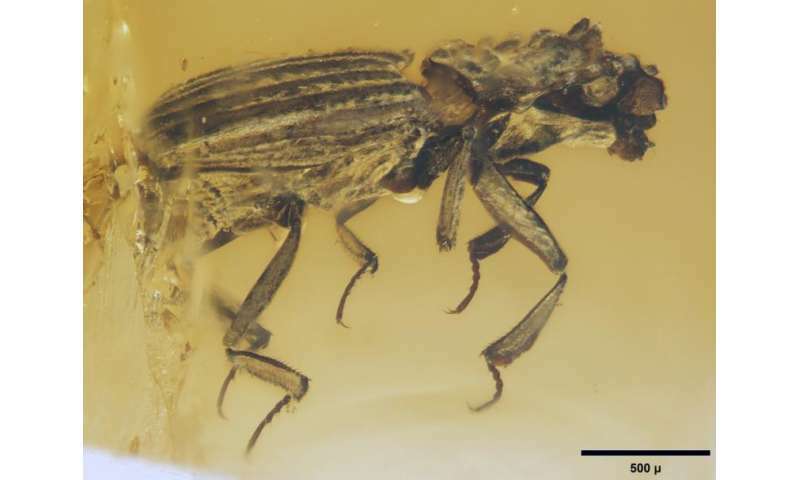 Caterino has co-authored a research article about the discovery with Karin Wolf-Schwenninger and Günter Bechly titled "Cretonthophilus tuberculatus, a remarkable new genus and species of hister beetle (Coleoptera: Histeridae) from Cretaceous Burmese amber." "In most cases, I wouldn't consider photography adequate for my research," said Caterino, who has been studying the Histeridae for nearly 20 years. "But at my direction, Karin and Günter were able to take fantastic photographs of the fossil that provided every angle I needed. 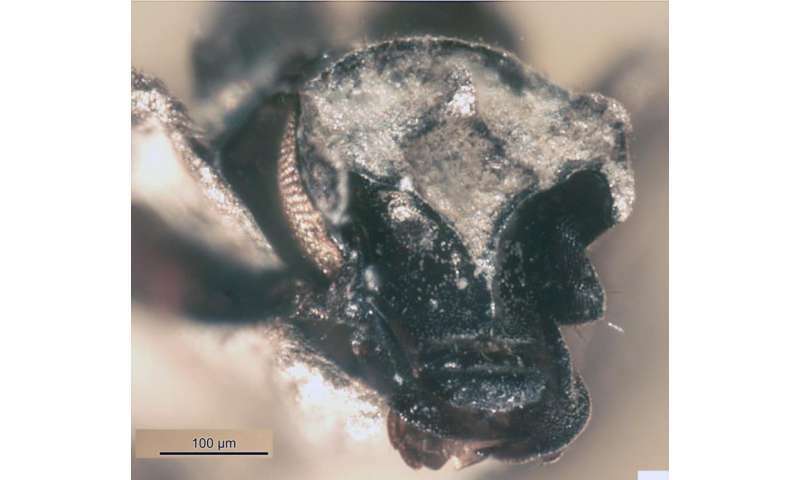 This is a new fossil genus species that we've called Cretonthophilus tuberculatus. Cretonthophilus indicates that it's a Cretaceous relative of the modern-day genus Onthophilus, while tuberculatus refers to the large bumps on the sides of its thorax." Several aspects of the anatomy of the new species suggest that the fossil species may have been associated with early ants. This is a common habit in beetles, and this would be one of the earliest associations. However, at this point this can only be hypothesized. "Unfortunately, ancient ecology is not so easily observed, even in excellent fossils," Caterino said. Fossils provide windows into the past, and with today's high-tech visualization and DNA technologies, along with a form of X-ray imaging called micro computed tomography that can peek internally into tiny structures, scientists are able to obtain more detailed data from fossil specimens than ever before. Caterino is currently discussing the possibility of CT-scanning the unique specimen of Cretonthophilus to see if its internal anatomy is as well-preserved as its exterior structure. "In determining evolutionary relationships by looking only at modern species, scientists are essentially guessing what the ancestors must have looked like," Caterino said. "But in this case, we are able to see the ancestor. This gives us a lot of incentive to go into more fossil collections and search for more evidence of what creatures looked like—and even how they behaved—millions of years ago."